Goriyas ripped from Link to the Past, plus 16x16, Pure, and Newfirst versions, and also versions with the shadows baked into the sprite. 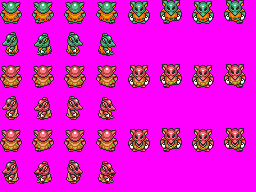 This is not only the LTTP Goriya sprites for the Z3 Module, but also 16x16 versions, Pure and Newfirst versions, and versions with baked-in shadows. I'm not sure if the firing animation works with Saffith's LTTP Goriya script. The green ones use CSet 9, and the red ones use CSet 8. The big LttP Goriyas are 22x24 in size, and take up 2x2 combos. Note: The fireballs will be ripped with the Cane of Somaria stuff due to reusing the same graphics.